It’s not unheard of for political candidates to try to prove to voters that they’re “just like us,” but some of the Democratic presidential candidates are going a little overboard with their efforts. When presidential hopeful Beto O’Rourke isn’t posting strange videos online, he’s causing a scene at coffee shops. Apparently no counter top in this country is safe from O’Rourke’s dirty shoes. I know I’m not alone when I say I think we all could have done without hearing and seeing all this. Four Democratic presidential candidates — California Sen. Kamala Harris, New Jersey Sen. Cory Booker, New York Sen. Kirsten Gillibrand, and Minnesota Sen. Amy Klobuchar — have previously spoken at AIPAC events, but are not scheduled to do so during next week’s conference after a progressive organization called for a boycott. Harris has spoken to AIPAC on at least two occasions. Last year, she spoke in an off-the-record breakout session, The Intercept reported. She also spoke the year before publicly. “I stand with Israel because of our shared values, which are so fundamental to the founding of both our nations. I believe the bonds between the United States and Israel are unbreakable, and we can never let anyone drive a wedge between us,” Harris said, during AIPAC’s 2017 conference. Klobuchar, who has been silent about her plans surrounding this year’s AIPAC conference, was interviewed by Claire Shipman at the event last year. Gillibrand, another presidential candidate who won’t be in attendance next week, took part in an AIPAC panel with late Republican Arizona Sen. John McCain and former Israeli Air Force general Amos Yadlin. Booker, who has not shared his plans on the upcoming conference publicly, spoke at an event with Rabbi Shmuley back in 2010. AIPAC “has refused to condemn the antisemitism of Republicans,” and they specifically called out Steve Bannon. Gillibrand, Harris, Klobuchar and Booker’s offices did not respond to repeated requests for comment. Is The ‘Year Of The Woman’ Ending As Their Presidential Campaigns Are Overshadowed? The 2020 presidential campaign is in full swing with a historic number of women running, and a very crowded race generally, as 14 candidates have officially announced they are running, so far; even more are expected to join the race. Top female candidates like Sens. Elizabeth Warren, Kirsten Gillibrand and Kamala Harris have all come out swinging, taking strong stances on topics ranging from Medicare for All, the Green New Deal and even reparations. Each female candidate is proving to be different from the other, and Sen. Amy Klobuchar specifically is separating herself even more from the overall group. The Minnesota Democrat is positioning herself as a moderate to appeal to the masses, repeatedly highlighting that her main objective is to “get stuff done.” She is running her campaign to attract progressive voters, but she is also making a conscience effort to not push away the undecided, independent or even conservative voter. But her policies, along with many of her fellow female candidates, are largely being overshadowed by the male celebrity-status candidates. According to recent polls, the candidate who is leading the race hasn’t even officially announced his candidacy yet. Joe Biden has dominated the news cycle, as speculations have circulated that he may have already picked his running mate – Stacey Abrams. Sen. Harris is actually polling as the third most popular candidate. Though the coverage of her campaign has been overshadowed by former Texas Rep. Beto O’Rourke, who announced his presidential campaign just more than a week ago. 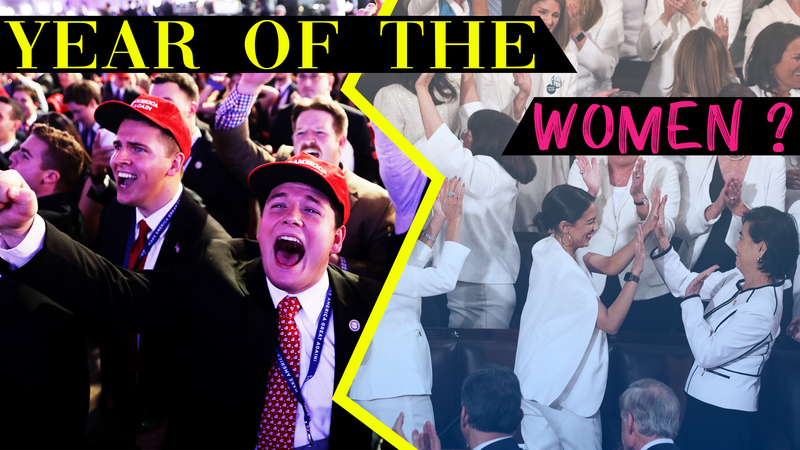 Will the ‘Year of the Woman’ cease to continue after the record-setting female House wins earlier this year? Tune in to see what is happening with the female presidential campaigns.